As Mother’s Day is fast approaching (only 3 days away), I’ve been thinking about how I can make my mother and mother-in-law’s day super special. Before we went to Mexico I went to the mall to get a few Mother’s Day gifts and landed in one of my favorite stores – Anthropologie. 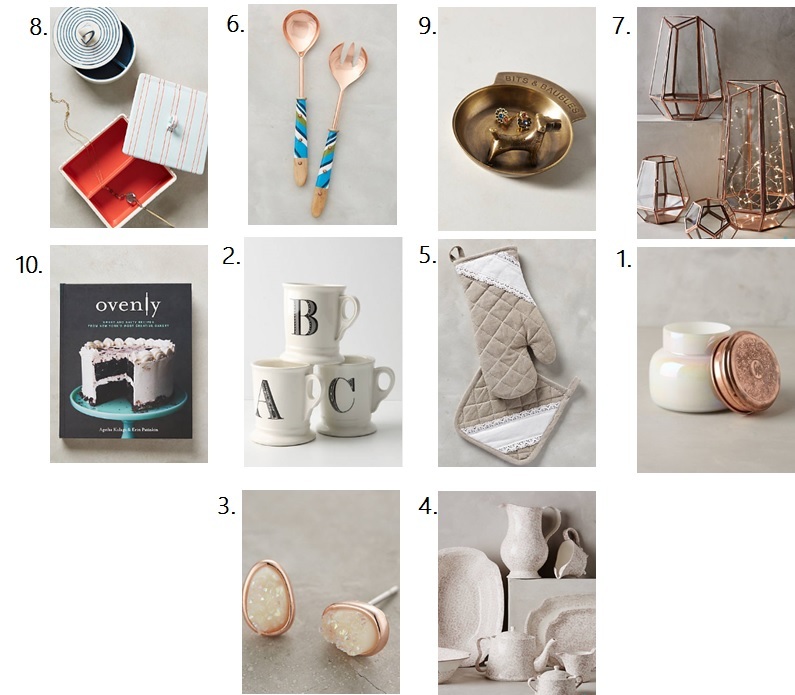 Anthro not only has the cutest clothes ever, but they have fantastic kitchen gadgets, house items, and jewelry that are perfect for our special moms. As I walked through the store I found a ton of gifts that reminded me of my mom and my mother-in-law and ended up getting them the best gifts (at least I think they are the best gifts). Now, I can’t share what I got them because they may be reading this post, but they are hidden in the all the gifts shown below. If you haven’t gotten your sweet mama a gift yet for Mother’s Day, take a look at the 10 gifts I’ve rounded up below. I’ve found all of these gifts at one store so it’s a one-stop shop for you! Time is running out! Head over to Anthro at your closest mall or online and order away! If you’ve ever been to Anthro, you know that their store smells amazing because they have their candles lit everywhere. Scents can bring back so many memories. Why not purchase a candle for your sweet mom so that every time she lights it, the scent will remind her of you. How perfect is that? I’m sure many of your mama’s drink coffee or tea all the time. I know my mom does. A monogrammed mug with their initial on it is perfect and personal. Plus, they’ll get great use out of it. Oh jewelry! Who doesn’t love jewelry? I know my mama does. Anthro does a great job of offering a variety of different types of jewelry – hoops, dangles, studs, etc – to cater to every type of woman. These studs are dainty and delicate, which is perfect for my mother & mother-in-law. I love vases and all plates, dishes, etc to dress up a dinner table or brighten your kitchen. This serveware is absolutely beautiful and delicate. Anthro usually sells pitchers separately which can be used in many ways – place some beautiful flowers in it and present them to your mom like that. It’s all in the presentation and detail! Is your mom a chef? Or does she just love to cook? Then these lace oven mits are perfect for her. They are cute and functional. Throw in an apron with this gift and your mama is set. Entertaining is big in my family! My entire life my parents have always had people over. One signature side dish my mom always prepares is a salad. This serving set has character, color, and will spice up your salad bowl every time you use them. Perfect for an entertaining mama! When I saw these, I thought they were super unique and could add some character to whatever space you decide to place them in. Plus, you can put just about anything in them to add some color, i.e. lights or plants. Great for mom’s house! Who doesn’t love little trinket boxes? This is a great gift for your special mama because she could use this as her jewelry box in her bedroom or bathroom. It’s simple, sturdy, and charming. Perfect for your mom! My mother-in-law loves her dog, Rufio – who doesn’t? He’s the cutest thing – so when I saw this, I thought she’d love it. The little dog in the dish is super cute and can be used to place rings or other jewelry while washing your hands or doing dishes. Simple, but useful gift! My last gift idea is a cook book. Anthro has the best books, let alone cookbooks. This one is all about baking yummy goodies. If your mom loves to bake, this is the cookbook for her.